March | 2015 | ReconfigurED. 40 million and counting. That is the number of students and teachers who use Google Apps for Education around the globe. But why are they using it? Furthermore, do schools use it to its true potential? Google Apps is a suite of free productivity tools designed to help students and teachers work together more efficiently and effec­tively. It is a multi-purpose platform with a myriad of educational and instructional benefits. As cloud-based technologies, they are always readily available, backed up, accessible at any time and place, and available to use on any device. They remain automatically up-to-date, and are constantly being refined and improved with increased functionality (see http://goo.gl/CdPj). Google’s foray into Education is enabling a total rethink in the way that teachers and students use technology for learning (see http://goo.gl/p4Cp4). Google Apps is an online solution that bridges the divide between learning at home or at school. It offers the opportunity for collaboration to happen in real time, irrespective of physical or digital location. Google Apps makes it easy to share with fellow students, teachers, parents and the wid­er community. Teachers can apply the appropriate security and share settings for resources as they see fit, all via one account and one password. Simplicity and flexibility at its best, it is removing obstacles for students, teachers, and even technical departments. From primary to tertiary institutions, students and teachers are realising the benefits of the Google Apps for Education platform. Google Apps has been growing fast, if not virally, over the last few years. There are currently over 40 million students using the service worldwide, and the number continues to grow each day. Google delivers a high quality service, at a cost-effective price, as an easy to use system, with powerful potential. With guaranteed reliability of 99.9% up­time, Google Apps is scaling at an incredible rate. Each week on Google’s Official Enterprise Blog (http://goo.gl/ipTXOO), stories are emerging of the continued uptake of Google Apps, and the way in which they are changing communication and productivity for the better once organisations have ‘Gone Google’. From connecting 45,000 schools across 7,000 islands in the Philippines, to equipping 4 million students in São Paulo in Bra­zil, Google Apps is bringing new and exciting opportunities to education. As technology is developing at an ever-increasing rate, Google Apps has the potential to make communication easier; and lead us to more powerful collaborative and connected experiences. Equipping this generation of learners with modern tools makes sense. This is why many schools are adopting Google Apps for Education, an extraordinary platform for the 21st Century. With powerful technology comes the opportunity to design powerful learning tasks which harness the richness that digital tools offer. However, this all depends on the extent to which the technology is used effectively for such opportunities. As educators, we should not assume that the use of technology leads to the automatic enhancement of learning and teaching in our classrooms. Instead, we should think about our deliberate practices and how they offer the opportunities to truly transform new opportunities for students which were previously inconceivable. In fact, let’s start thinking about how much of our use of technology is in fact transforming classrooms, instead of getting carried away by the simple urgency to use digital tools with our students. Educators often talk about how apps or software are “transformational” because they are engaging or motivating, or personal devices that are in the hands of students lead to transformational “approaches”. For me, the transformative opportunities in today’s digital age with technology are when the technologies are used to connect, share and widen classrooms, which in my opinion, are scarcely met in a genuine sense. 1) Does the task create capacity for critical thinking on the web? – The extent to which critical thinking and higher order cognitive skills are utilised with the web. The word “web” here is particularly important as it offers the opportunity to broaden perspectives, break down the barriers of place and time, and share and connect across communities. 2) Does the task enrich the possibilities for students to develop new lines of inquiry? – The extent to which the technology is used in a way that sparks curiosity and provides the avenues for students to develop and seek questions. 3) Does the task broaden the conversation via authentic audiences? – The extent to which the technology is used to flatten classroom walls and open dialogue and interaction between other students, teachers, parents, and the wider community. 4) Does the task allow opportunities for students to publish with the possibility of continuous feedback? – The extent to which the technology is used to publish student knowledge and synthesis with the opportunity of viewership and feedback from others without the restrictions of place and time. 5) Does the task allow opportunities for students to create contributions? – The extent to which the technology is used for questioning, moderating, collaborating and co-creating with others. 6) Does the task expose students to “best in the world” examples of content and/or skill? 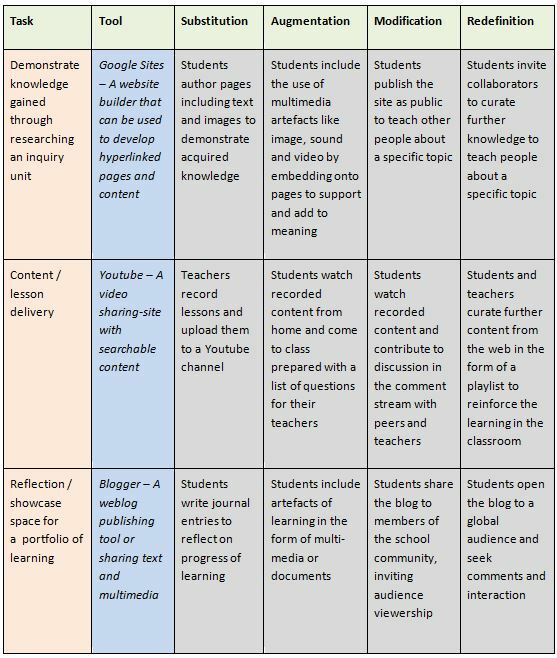 – The extent to which the technology is used to demonstrate high quality examples of the learning objectives content and/or skills. If the answers are more no than yes when analysing the impact of technology to the task at hand, then we could suspect that transformation is not taking place. 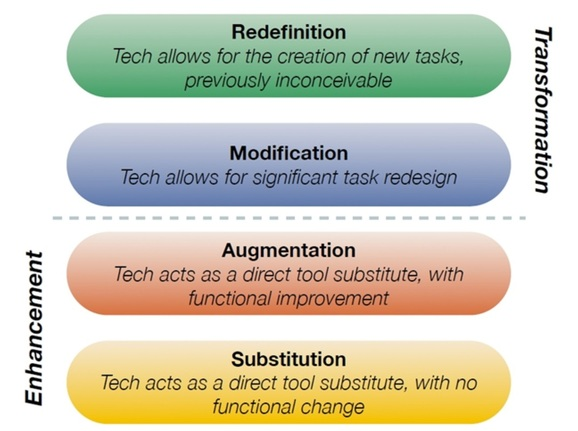 According to the Substitution – Augmentation – Modification – Redefinition (SAMR) model by Dr Ruben Puentedura, transformation occurs when the technology has allowed for significant modification of the task and / or created new opportunities which were previously inconceivable. Beyond substitution with Google Apps for Education. As educators, how do we harness the richness of Google Apps to go beyond substituting the traditional tools employed in many classrooms? Take the example of Google Docs, a light-weight word processor delivered through a browser or the use of an Android / iOS App. Let’s assume that students are crafting a piece of writing that might normally be achieved with paper and pencil. Students could use a static word processing application to type up a draft or final piece of writing. In this case, one could argue that nothing significant has taken place except that, instead of using paper and pen, students have used a device and application to communicate their thoughts. Here, substitution of the paper and pencil has taken place. If students drafted or published their piece using Google Docs, their piece becomes accessible from any device with an internet connection, and thus removes the physical barrier or carrying around the paper and pencil. Whilst the purpose has slightly changed, augmentation of the task has occurred. The improvement means increased student access and word processing ability that is irrespective of neither place nor time. If students share their Google Doc with multiple classmates then this could open the opportunity for collaboration and synergy to the task. The students might ask to receive feedback or invite input from peers or the teacher. The teacher could check the revision history of the document to monitor the activity and progress of the exercise. Through communicating and working together in a production space, modification of the initial task has taken place, and an entirely new opportunity has been created, that goes beyond paper and pen that was once private to the student. If students share their Google Doc with ‘view’ or ‘comment’ access to a global audience then this could open the opportunity for authentic connections that go well beyond the classroom community. The task of processing words has transformed to an opportunity which requires a set of high-level thinking skills, where a stage is offered for students to share their learning beyond their local contexts. Below are further uses of Google Apps for Education with the SAMR model.